Julie Gilhart on the future of sustainable fashion, the complicated relationship between business and creative, recognizing greatness, and finding calm in chaos. You’d be hard-pressed to find someone more intimately acquainted with the ins and outs of the fashion world than Julie Gilhart. 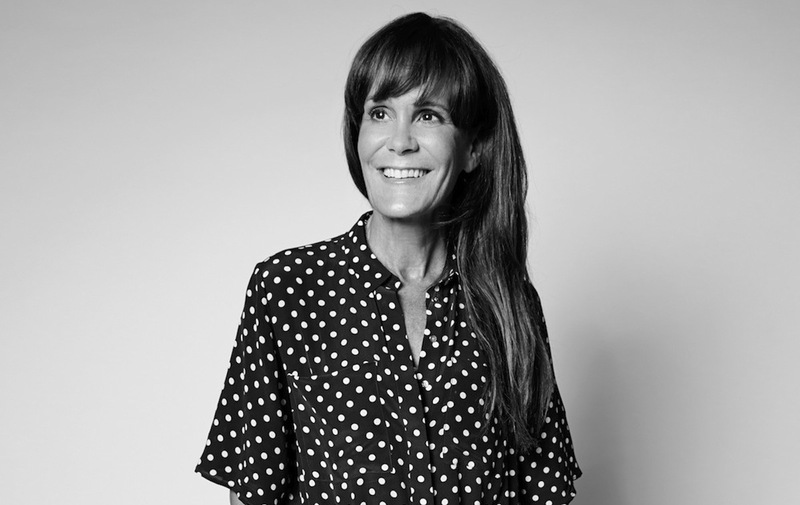 She honed her eye for talent as a buyer at Neiman Marcus before ending up at Barneys, where she’d remain for eighteen years, rising to the role of Fashion Director and earning a reputation as a champion of challenging, up-and-coming designers. Since 2013, she’s worked as a consultant, developing relationships with brands of all shapes, sizes, and configurations. She’s also on the Board of Directors at Mulberry, Parsons The New School of Design, and legendary surfer Kelly Slater’s new label, Outerknown — an avid surfer herself, the last one’s a natural fit. We chatted with Julie about her latest project, moving toward a sustainable fashion future, balancing business and creative, and finding calm amidst chaos. 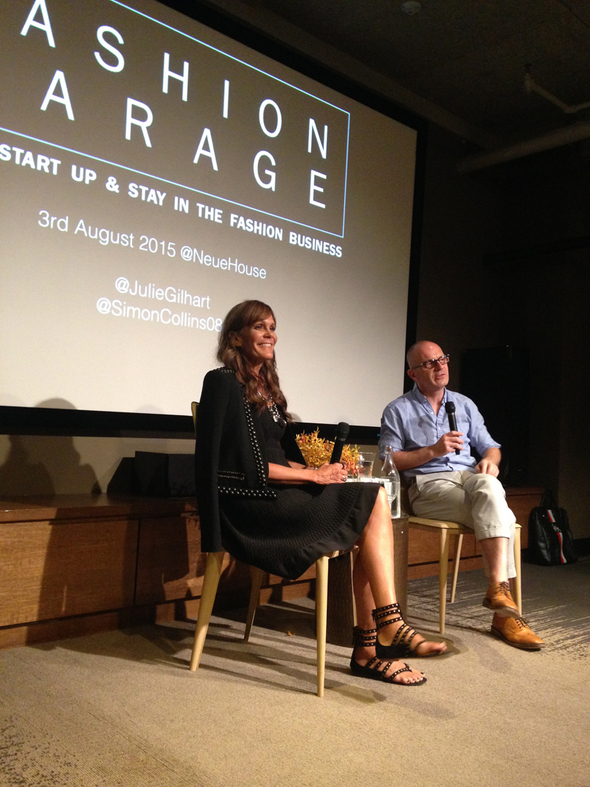 You’ve just debuted a new project with Simon Collins called Fashion Garage. Could you tell us a bit about it? Simon’s a friend — he was the former Dean of Parsons — and we met while I was the Fashion Director at Barneys. We’re both now out as consultants, and we were having a cup of coffee and talking about the amount of people that call us for advice — “Can we just have an hour of your time? I’d love to get your opinion and advice on what I’m doing.” Many people from students, to designers, to people who have some sort of relationship to or career in fashion. He was saying that there are so many of these people, and I’m like, “Welcome to my world.” I could literally meet with people all day, just doing that. And it was sort of a frustration for both of us, because we actually like to give advice, we like to see what other people are doing, and it’s something that makes you feel really good about helping and giving back, but there’s only so many hours in the day. So, we decided, why not invite all those people to come together and we can give advice at one time? So, that’s how it came about. We just did it. I looked at my list of people who wanted to talk to me and also people who I kind of talk to on a regular basis, and we both put our lists together and invited people. It was on a Monday in August, and we thought that not that many people would come, and 150 people showed up. What was really amazing about it was not only did it feel like we could give good advice and field good questions from the audience and questions from Twitter, but it also brought people together. And the one thing I saw that I hadn’t thought of before was that there are some people who are in dire need of advice, but they don’t ask. So, it was really nice to be able to have those people come and listen, and maybe they don’t have enough confidence to ask a question, but they can take what they hear, and maybe be a little more confident going forward. It was 100% win-win. We’re going to do it again, and where it’ll take us, we don’t know yet, but we’re going to plan another one for October. Would you say there were any dominant themes throughout the evening’s conversation? I was surprised at the questions that came in terms of responsibility and sustainability. We had a lot of people asking about how you can incorporate that into what one is doing. That was one that surprised me, but also made me really excited, because it’s a platform I do love to explore. And then there was the general feeling of, “How do I grow my business? Do I grow it through my own channels, my own digital site? How do I work with stores? Do I start to sell through social media?” All these questions. But, I have to say, it was pretty balanced across all the things that have to take place in one’s business. It seems like we’ve reach a sort of critical mass on sustainability in the fashion industry — it’s no secret that it’s something that needs to be tackled and needs to be addressed, but it’s so complex. If you’re a brand that really wants to make sustainability a focus of your business, where do you start? I think it’s really important to note that if you’re in the fashion business, you either do one of two things: you follow trends, or you pick up on energy and you create energy. I think that sustainability — or responsibility or ethics, or whatever you call it — is an emerging trend that does have energy. You have to pay attention to it. There are three things you can really look at: what is your supply chain? ; what are your materials? ; and how and where do you produce, who’s actually making it? When you’re big and you already have a developed business, it’s really hard to go back and re-do. If you’re small, it’s easier to build. Sometimes it seems more costly, so you have to examine it. The first step is to be conscious and aware of where you are right now and start to chip away at it. If you think you’re going to build the Pyramids, it seems impossible. But if you start with one stone, eventually you’ll get the Pyramids built. So, I think that’s the way we have to look at it. We spend a lot of time talking about the bad things. Take fast fashion. Everybody bashes fast fashion. In my dreams, I would love to see a fast fashion brand that’s made well, that has a proper supply chain, that uses great materials. That pays homage to the human part of it, to the labour. I think it’s possible. We need to look at the way the world is now — pretty soon we’re going to have nine billion people on this planet. So, that’s a lot of people to clothe. We still need to push ways of re-thinking the way we buy and use clothes. It’s going to take a lot of changing consumer behavior, and we all know that behavior is hard to change. So, we need to chip away at that, too, but we also need to accept that fact that fast fashion will probably exist, so let’s make it better. You can still be a profitable business and be a responsible business. The other thing about sustainability that I think is very interesting is the investor scene. We’ve seen the tragedies that can come from not doing things in the right way. For example, Rana Plaza, where over a thousand people were killed. So, what does that say if I’m an investor? I want to invest in something that’s pretty much risk-free. We’re seeing how risky not being sustainable can be. It’s a different way of thinking about it, but if I was a new business, or if I was a business that wanted to grow, I would definitely want to position myself to be very tasty to any kind of investor that would want to invest in me. What do you feel is the biggest challenge facing young designers today? You know, I actually think it a lot easier to be a successful designer today than it was previously. I can really read energy, and I know when I see an emerging designer — when I met Alexander McQueen, I knew there was something there. I knew when I met Riccardo Tisci there was something there. I knew when I met Rick Owens there was something there. This was before anybody had bought their collections. When I was at Barneys, I spent a lot of time trying to find those people. That was our key to building businesses — you find the talent, you nurture it, you give it support, and you can build a brand. Now, you can come up with a business idea, you can insert somebody really creative there, and you can create a business, too. It’s actually much easier for somebody who wants to be in this business to get into this business, because there are so many different ways you can be in it, and so many different ways you can tell people about yourself. It was so much more difficult in the past. So, maybe the difficulty now is that because it’s easier to be noticed, it’s almost a bigger pond with more competition? Certainly more competition. You have to be creative in different ways. To have the skills to be able to creative in marketing is very important. Again, all those people that I listed, we would make the proper introductions, we would show them off through advertising, and windows, and personal appearances, and all that, and it would be a gradual build. But things got faster. The beauty of today is that so many people can be in the fashion business, just like they can be in photography, and film, and music. It’s very easy to do something and spread yourself. But, yes, there’s more competition. That being said, I think that greatness is always here. And it’s just about finding the people that have it, and making sure those people are supported in the right way. They’re the ones that change things. They will redefine fashion and push their energy forward. I think the schools are really important for that. Everything’s getting younger. We’re much more aware of who’s in school, what they’re doing, what happens to them when they graduate. There are so many contests, so many ways to get exposed early on, and get money, and get mentorship. I think going to school is very, very important, because you have a community you can pull on. That’s how the schools should be setting themselves up. Do you think there are too many prizes to be considered for, contest to apply to? Is it a healthy thing for young designers? Or do you think it skews their development, or causes them to try to do too much, too fast? No. If you look at the Woolmark Prize, and go back, the original winners were Saint Laurent and Karl Lagerfeld. And, you know, they sure developed into something great. I think the contests are great. They offer mentorship, money, and exposure. They offer an opportunity for people to meet each other that may not have met each other. That’s great. it works for some people. Different types of people, it can really work for. I think the real thing is the post-contest. The talent that’s applying to the contests, they have to have a sense of their own pace. Some people can move really fast, some people need to move slower. They need the right sort of financial investment. Some investors want their money right away, and there are some investors that don’t. So, they need to hook in with the right type of investors for them. Mentorship is great, and all of these contests offer some sort of mentorship, but I think designers have to really be looking for that day-to-day person, whether it be their partner, their President, their CEO, their Director of Sales — whatever it’s called, they need someone there they can partner with every single day who can make good, sound business decisions and know how to run a structured operation. For designers, there are too many distractions right now, and I think that whatever you can do to get them in their creative space, and to concentrate on the product and on design, and think of things that haven’t been thought of before. I think that the beauty of some of the great designers now is just that, that they had a little bit more time to be creative. Maybe one of those great business-creative connections will be made at the next Fashion Garage. Or maybe one was already made. Maybe! Maybe. That would be nice. We’re living in an age of anything can happen, anything can be created. It’s really pretty exciting. We have to keep it simple. For myself, I have this talent for curating talent, and I like to build new brands and re-build old brands. I try to keep concentrated on that, but hold a lot of integrity and authenticity. I think those are big words for me — integrity, authenticity, transparency. You mentioned earlier a list of legends whose energy you immediately picked up on. Lee McQueen, Alber Elbaz, Riccardo Tisci. Have you encountered anyone who’s given you that same spark in the past couple years? You know, I have to say it’s been few and far between. I can look at someone and say, “They’re gonna be really successful,” and in the past, I based it more on what they created in terms of actual product. Now, the rules are a little more lenient. It goes into that category of a good marketing idea. I have to say I see that a little more, and get excited about that. But I always like to bring myself back to the first time I met McQueen, or the first time I met Rick Owens, somebody like that. It’s a very special thing. It doesn’t happen that often. I get most excited about the kids that are just creating to create, because they want to. People all the time say, “I wanna be the next Karl Lagerfeld,” “I wanna be the next Ralph Lauren,” “I wanna be the next Donna Karan.” You will never be the next. There will never be another. If you want a legacy, you’ll have your own, special legacy. But you can’t recreate what happened in the past. All those people grew the way they did without what we have now. It’s a very interesting time. You have a lot of money out there that’s very interested in investing in fashion. And they have rules, and they have data on a sheet of paper, but I don’t know if they can actually feel that magical, mysteriousness that you feel when you meet someone, and you see something, and it’s like this moment of, “Booyah!” You know? I’m very protective of the creative side. Like great artists, you want to surround them, and give them the space, and you want to protect them from all these other things so they can do what they do best. That’s really interesting — how do you help these people with the structure and the finances that are needed to do what they do on a larger scale that’s profitable while still creating something that’s innovative and, nowadays, also responsible? It’s a really interesting puzzle. Yeah. And there was a moment there where many of the really big designers seemed to end up responsible for their own label while also designing for another house with a longer legacy — the era of McQueen doing, like, twelve to fourteen collections a year while Galliano was doing the same thing. It seems to me that designers are beginning to shy away from that — Wang leaving Balenciaga, and so on. Do you think that era is done, that designers are recognizing they need to give themselves more space to create? I don’t think you can put an absolute on that. You have to look at the individual, and what is the right space for them to be happy and creative versus overwhelmed and stressed. It’s different for different people. Look at Lagerfeld, the ultimate multi-tasker. He can do so much, and have so many things going on, and be so successful, and seemingly enjoy it. I can’t speak for him, but that’s the impression you get. Yeah, I’m not sure anyone can speak for him. But then you have other people like Martin Margiela who can be incredibly successful and you never saw him. That was the right cadence for him. Everybody is different. There is no absolute. You have to look at every situation a little different. It’s like how you can’t treat all children the same. There are different personalities. I think that’s what’s interesting about all the money and the investments — it comes with this sort of structure, but it’s like, no, you have to have a lot of intuition and feel for a designer. There’s an interview you gave where you quoted Bill Cunningham as saying that he felt that fashion always reflects the world we live in. I think that’s something that’s obviously true. So, what does the fashion landscape today say about our world? It’s full of contradictions. We have more people making more money at a younger age than ever before, and at the same time we have people at the bottom of the pyramid that really need our help, that can’t survive on their own. There’s a great meditator named Thích Nhất Hạnh, and he says that when there’s confusion and there’s chaos, you just sit. And I think that’s what I’d say to people — we all just need to take a pause and think about what we’re doing, how we’re doing it, and where we’re going. And then hone in a little bit, and focus, and move on from that point. And the beauty of fashion is that it can incorporate a lot of different people and a lot of different things. You can be anything and you can be in fashion. You just have to decide what your true, authentic self is and work from there.